What follows is a small antidoron (*) for all the blessings I tasted in this retreat! I have already made up my mind that I will be going back to this parish on the regular! Thanks for having us St Andrew’s parish! Need exercise? Edinburgh is hillier than either Rome or San Francisco. Exploring the city even for half a day rehabilitated many long neglected muscles of mine! 6:30pm Vespers. One immediately senses what a warm, close-knot Orthodox community this is. 7:30pm Archimandrite Fr. Raphael Pavouris, , a wonderful Greek hieromonk who spent time on Mount Athos, offers a homily on Holiness in the Bible, followed by dinner and evening prayers. Fr Raphael gave us a talk on Holiness in the Bible. The Bible is holy in itself and was inspired by the Holy Spirit, but is also a call to holiness through examples (Elisha giving himself fully to the call), visions of holiness (Isaiah 6) and reminders that we are being sanctified through that call. We then shared an Agape meal, both visitors for the weekend and local parishioners. A wonderful start to the Fellowship’s first study weekend in Scotland, at the Parish of St Andrew in Edinburgh. Father Avraamy (Neyman), left, and Father Raphael (Pavouris), right. These exceptionally kind men are pillars of the Orthodox communities in Scotland. Matins was chanted in Russian style by Fr. Luke Jeffrey and his Khouriya. I also met in the church Fr. Michael Harry and his Khouriya, all four of them ‘converts’ and most humble and compassionate. Presbyter Luke presbytera was very good with the chanting (Russian style) and Fr. Luke was most compassionate, in encouraging us with his humility, kindness, meekness and gentleness to join him in the prayers. In a style quite unusual for a priest, Fr. Luke, during Matins, kept getting out of the altar to check on how we were doing. Were we dozing off ? 🙂 Were we distracted? Such kind eyes! Or were we paying attention to what was being chanted, pleading to God with fervour and joining our prayers to his to Heaven? For the Uncreated Church and for all mankind. In truth, I have felt most grateful during these services , and ever since, for Christ’s compassion in instituting the Church and offering to us His priests for the Sacraments. And I realised too how much we must do to help all priests and pray for them. Indeed, Fotini is right. 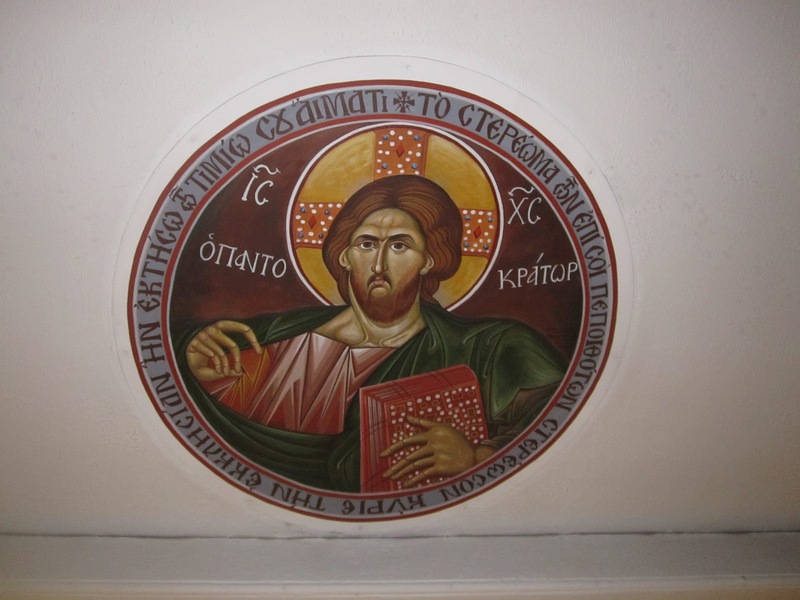 The Church is our Arc, “Κιβωτός”. 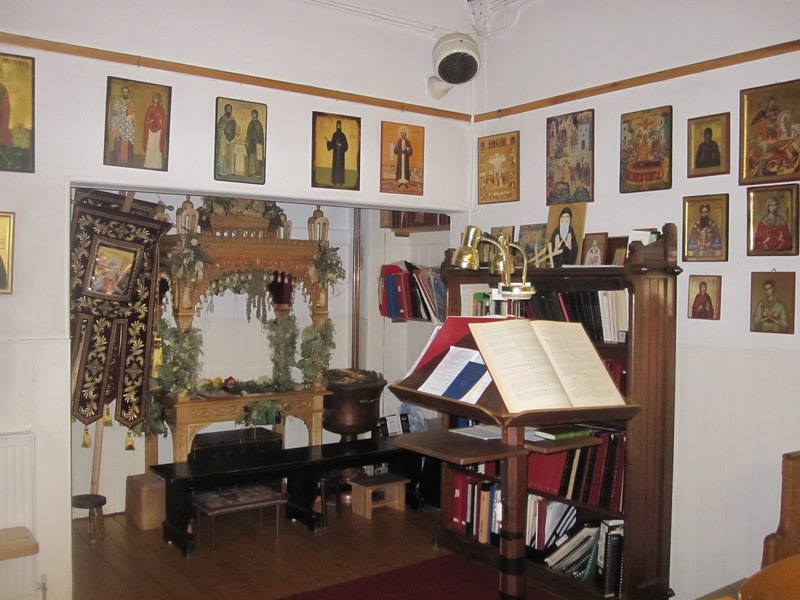 Reminiscent of the early Christian house churches, the sanctuary itself comprised a large room in the front of the house, with dozens of icons covering the walls and a small iconostasis at the eastern end of the room. I will always remember the wonderful people I met while attending the divine services here. Deacon Luke and his very kind Khouriye, both converts to the faith, the English convert Stephen, a very kind student at the University, Mattheus, a Greek physical fitness instructor, with his English wife and their two pious daughters chanting so beautifully at the kliros throughout the long services, Marian, a Romanian, always ready to offer coffee, tea, biscuits, and kindness and smiles, and so many of the other Romanian, Russian, British, Greek, you name them, parishioners, which have all made lasting impressions on me. One feels so immediately welcome here and wants to return! Such hospitality and love! St. Andrew’s is a pan-orthodox Church based in Edinburgh, a parish of the Archdiocese of Thyateira and Great Britain, which is in turn part of the Œcumenical Patriarchate of Constantinople. St. Andrew is an important Saint for both Constantinople, being its patron Saint, and Scotland, being again its patron with his cross the Saltire and her flag: sailtír, flagan tsailtír, bratach na hAlban. St. Andrew’s have services and Liturgies daily (! ), not only on Sundays, or on major feasts. I am not sure if there is any other parish at the UK like them, with the exception of course of Essex monastery. They worship primarily in English, but you will also hear Greek, Slavonic and Romanian. Their Father in Christ is Archimandrite John Maitland Moir (b. 18 June 1924-d. 17 April 2013), who founded the parish out of his home in George Square. Father John’s life had elements of the popularised, practical and unconventional Mere Christianity of C.S. Lewis, to which he added layers of spirituality and asceticism .… In a world where genuine eccentricity or commitment is scarce, that Orthodox minister who put an eccentric spin on life, left a legacy of dedication. Memory Eternal! Maitland Moir established the Chapel of St Andrew in Edinburgh, first in his living room with some 20 worshippers. This flock grew and in 2003 he sold his house to buy a former school building but this also became too small. Funds to expand further were insufficient. On his deathbed, Maitland Moir gave thanks to God that his dream was fulfilled. An anonymous benefactor had come forward to complete the purchase of a £350,000 building for the community. Alongside a full weekly program of services of worship, St. Andrews parish is blessed with a large and lively multicultural community. Among other activities, you will find here an active student society, a charitable fellowship and community meals. The three priests of the parish are also in charge of the Archdiocese’s parishes scattered across eastern Scotland, Aberdeen, Dundee, St. Andrews, the Highlands and Bamburgh in England. The parish began its life as a chaplaincy mainly for Polish servicemen during World War II, whilst the liturgical language used in the beginning was Slavonic. However, as the years passed, it is evident that the ethnic composition of the parish has become a less important factor, altering towards a presence of the universal Orthodox Church in Scotland. This is, thus, an exception to the rule within the Orthodox Cosmos where ethnic background is a key factor within a community, nevertheless the Orthodox Church in Scotland seems to have transcended the boundaries of national identity. Currently English is widely used within the services, on the other hand Greek and Slavonic are retained in order to unite different traditions within Orthodoxy, due to the fact that the community comprises of English, Scottish, Greeks, Russians, Serbians, Romanians and people from other countries. About the Orthodox Fellowship of St John the Baptist: The Fellowship brings together members of the several Orthodox Church traditions in the British Isles and Ireland through prayer, discussion and mutual friendship, to deepen our commitment to, and understanding of, the Orthodox Christian Faith. The Fellowship arranges or sponsors a series of annual events, including a summer conference and a youth festival in the spring, and a study weekend in the winter. This year the Fellowship visited Scotland for the first time. Bless the Lord, my soul! What a retreat! How many blessings in store for us! God willing, I shall return here. If it were only Edinburgh, I would certainly not be the first one to fall in love with this city, but my heart was captivated by St. Andrews’ parish. Here is indeed something greater and rarer to find. (*) Antidoron (from Greek, meaning “instead of the gifts”; in Arabic, qurban) is the remaining bread from a loaf of prosphora after the Lamb has been removed for the Holy Eucharist. In Byzantine practice, it is blessed during the megalynarion to the Theotokos immediately after the epiclesis in the Divine Liturgy and is given by the priest to the faithful after the service. Historically, it was distributed only to those who had not received ‘the Gifts’, Holy Communion so that they would receive a Blessing in place of Holy Communion but this practice has changed over time and all those present at the Divine Liturgy receive Antidoron as a blessing. 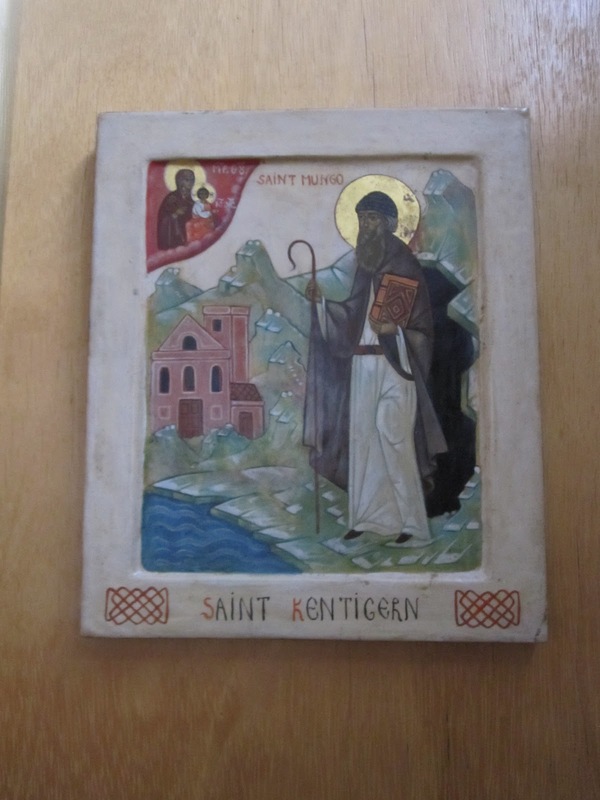 This entry was posted in Living Signposts, Orthodoxy All Over the World, Pilgrimages and tagged Father Avraamy Neyman, Father John Maitland-Moir, Father Raphael Pavouris, Orthodox community of St Andrew, Orthodox Scotland, Orthodoxy in Edinburgh, Orthodoxy in Great Britain, Scenic Edinburgh, Westminster Cathedral.